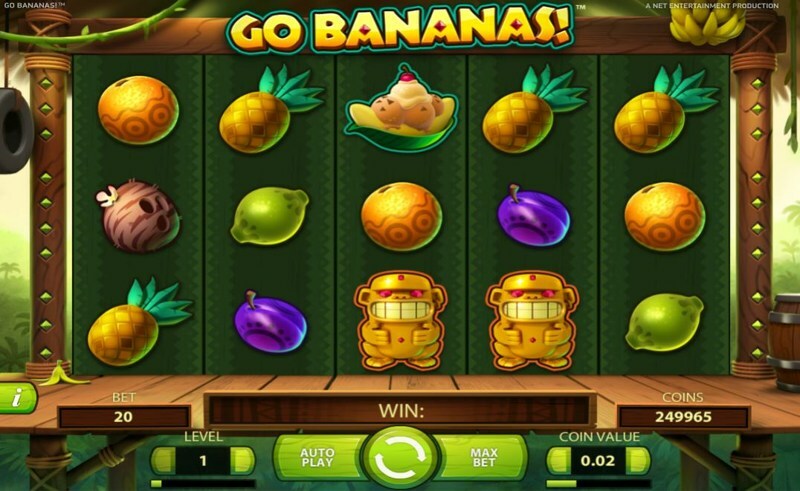 Go Bananas is a game from Net Entertainment, that was – due to delays – highly anticipated amongst the online casino community. Its eventual release was met with overall positivity, and it’s easy to see why. Go Bananas is fun, exciting, and filled with unique features and bonuses, helping to make the playing experience as enjoyable as possible. The game itself is classic Net Entertainment; 5-reels, and 20-paylines make up the structure of the game, and in-line with the Monkey theme, the reels and backdrop are designed accordingly. The background to the game is a rich Jungle, with a wooden stage being the part the houses the reels. The reels themselves don’t look like your typical slot reels. They’re not particularly well defined from one another, and for players not experienced with Video Slots, it could appear as though there are no reels whatsoever. Thankfully, that’s not the case. Thankfully, Net Entertainment have opted away from playing card symbols to make up low-paying symbols, instead, choosing game specific symbols, with the low-paying of the bunch being various fruits, including Pineapples, Plums, Limes, Coconuts, Oranges, and a Banana. The high-paying symbols include Bongo Drums, a Monkey’s Money Clip, a Golden Statue of a Monkey, and a Bright, Vibrant Pink Gemstone. There’s also a wild symbol, which takes the form of five different animals – it’s part of the bonus-round, so more on that below. Go Bananas is available to enjoy from desktop computers and laptops, as well as mobile phones and tablets. Simply access your chosen online casino, open up the game, and tilt your device into landscape mode to begin playing. Note: For an optimal gaming experience, it’s always recommended you try and connect through a 4G or WIFI network; 3G will run the game, but graphical quality may be affected. Wild Tarsier – Turns either a horizontal or vertical strip of two symbols into wilds. Wild Langur – Turns three symbols wild in a horizontal strip. Wild Baboon – Turns three symbols wild in a vertical strip. Wild Orangutan – Turns four symbols into wilds (in a square formation). Wild Gorilla – Turns five symbols wild, in a “X” shape. Now, the big payday comes when you manage to land two or even three of the wild symbols at once. That’s because more than one animal can “trigger” at any one time, so if you were lucky enough to land one of the animals on the first 3 reels, and another on the 4th or 5th reel, you can make massive wins!